Oregon's Hood River flows north from Mt Hood through the Hood River Valley and into the Columbia River at the town of Hood River, Oregon. Mt. 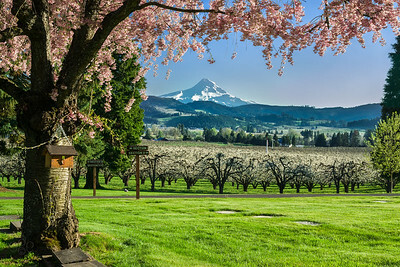 Hood rises majestically above blossoming pear trees at Pine Grove, Oregon in April. Foreshadowing a frightening future event when Hood - like its sister volcano Mt. St. Helens - reawakens, the setting sun reflects off wind-driven snow on Mt. Hood's north side, May 5, 2007. Mt. 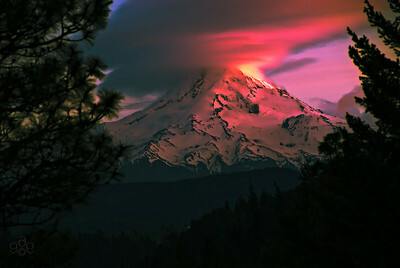 Hood is a dormant volcano 50 miles east of Portland, Oregon where it is located on the Pacific rim of file. This view is from the east side about 5 miles south of the I-84 and OR 35 exit for Hood River. The sun is not in the image. It is far to the right and north of the mountain. This unusual sunset event is a fortunate combination of a storm on Hood, cloud formation over Hood, clouds farther to the west and the sun setting at exactly the right angle north of Hood. It had been cloudy that evening, but I decided to see if I could get a shot of Hood before the end of the day anyway. I was amazed by the view, jumped from my car grabbing the tripod and starting to shoot with out checking exposure or focus. Fortunately, the event lasted long enough for me to slow down, get composed and take a couple of dozen images. I've never seen a more dramatic natural event. 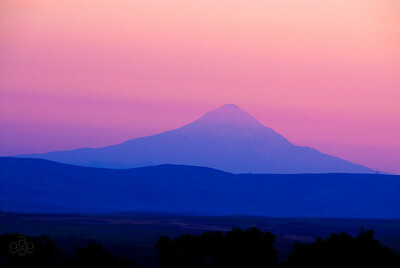 Viewed from the observatory grounds in Goldendale, Washington, Mt Hood stands blue against a pink twilight sky. 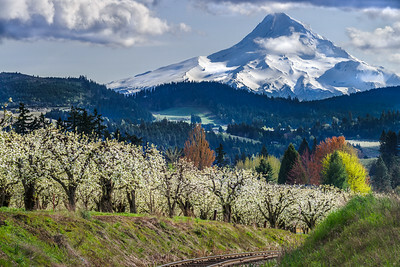 Looking north in the Hood River Valley, Mt Adams in Washington dominates the horizon at the end of the spring blooming season. 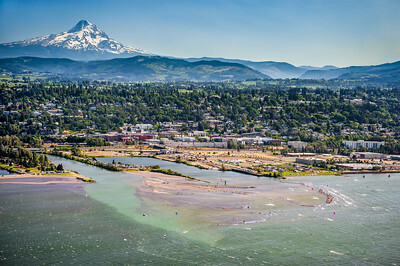 Kiteboarders and windsurfers flock to the summer wind capital at Hood River, Oregon. Here, ant-sized kiters fly off the sand spit at the mouth of the Hood River. Mt. Hood to the south provides the dramatic backdrop for a beautiful kiting or sailing location. This mid-afternoon shot captures the peak of the kiting action. Oh, yes, the wind-driven white caps on the Columbia River are usual, unlike almost every other river. View this image at full screen to see the individual kiters. It was uploaded at 4096x2726. The detail is phenomenal from just 12 mega pixels - but not quite good enough to see the kite lines :) Note that contacts can see the original uploaded file. 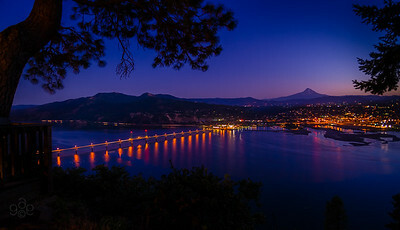 The lights of Hood River and the bridge to Washington surround the mouth of Hood River. Mt Hood punctures the twilight skyline. Most likely, Jupiter is visible as a tiny stretched dot in the full resolution image about one-third of the way to the top of the screen from Mt. Hood's peak and to the right. No star outshines Jupiter, except our sun of course. On a cloudy mid-April day, Mt. 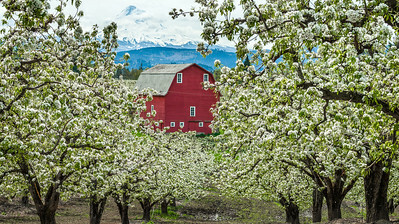 Hood towers behind the red barn admist the pear blossoms in the Hood River Valley, Oregon. 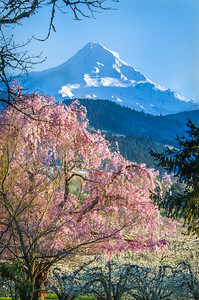 The towering appearance of Mt Hood benefits from the use of an 80mm short telephoto. 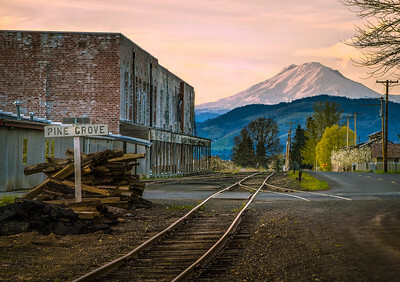 At the end of the Hood River Valley, Cooper Spur road climbs up Mt Hood in Oregon. At the end of September, Nature prepares it's autumn coat of colors at the last farm from Parkdale south to Mt Hood and Cooper Spur. Foreshadowing a frightening future event when Hood - like its sister volcano Mt. St. Helens - reawakens, the setting sun reflects off wind-driven snow on Mt. Hood's north side, May 5, 2007. Mt. Hood is a dormant volcano 50 miles east of Portland, Oregon where it is located on the Pacific rim of file. This view is from the east side about 5 miles south of the I-84 and OR 35 exit for Hood River. The sun is not in the image. It is far to the right and north of the mountain. This unusual sunset event is a fortunate combination of a storm on Hood, cloud formation over Hood, clouds farther to the west and the sun setting at exactly the right angle north of Hood. It had been cloudy that evening, but I decided to see if I could get a shot of Hood before the end of the day anyway. I was amazed by the view, jumped from my car grabbing the tripod and starting to shoot with out checking exposure or focus. Fortunately, the event lasted long enough for me to slow down, get composed and take a couple of dozen images. I've never seen a more dramatic natural event.